1.Do a cleaning,check the nozzles. Do small cleaning, press TEST to print a test strip. Lf still exist the problem, follow Step3. if still exist a problem, contact us. Check the control panel if it is as shown at right pic. lf not, press LEFT back to main interface, as right pic. Then resend the print job. lf it is already the right pic do Step2. 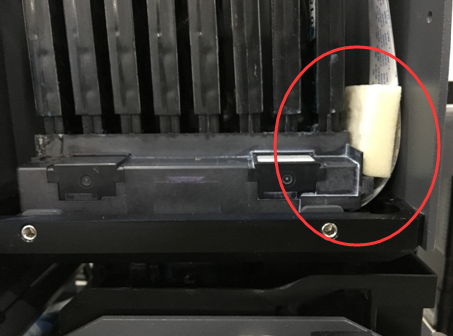 Reconnect the USB cable, then restart the printer. If still exist a problem, contact us. should not be stayed on this switch. You canchange the mode to Uni-direction. Ifthe problem is gone and the printing is like the following picture, then we are sure it is a bi-direction problem. 2. How to solve a Bi-direction problem? And change it back.Or you can save the settings for next time downloading.